A unique game where the objective is simply to flip all of the tile over. There is a catch though (isn’t there always? ), You can only move the amount of spaces shown on your current tile. Sounds easy, but it isn’t. Just give it a try, you’ll see how frustratingly fun it is! Source, first line includes permission to use the titlescreen font and sfx license. Here’s a short video to give an idea about the gameplay. This is my first attempt at anything using python. It was created within a couple of weeks in my spare time (an hour here and here). I think it turned out OK.
Python Game Jam #1 final results! I’m still a bit unsure about the rules. Is it supposed to be ‘you can only move exactly X spaces’ or ‘you can move up to and including X spaces’? Only exactly X spaces. So if you get a 10, you have to move exactly 10 spaces. It would be easy otherwise! Ah, I missed the ‘exactly’ there. I find the grey on green a little bit hard to read. What about the K, Q and ‘!’ tiles? @spinal I think I found a bug .or sure would like to believe it is one… I got stuck flipping a Q. But all tiles available we’re flipped so wasn’t able to select anything, I had 3 ‘!’ so wasn’t too concerned, but to my surprise pressing B in that case didn’t let me use a ‘!’ to flip any tiles. Hmm, pressing B only work if your on your starting tile. So sometimes you’ll need to press b twice, once to reset the move then once again to use the !. Yeah we did that believe me. If it would of work I would of won the game lol I was hammering the b button on the starting tile. I’ll see if I can track that bug down, I have a little idea about tracking unplayable moves too. Might take some doing though. 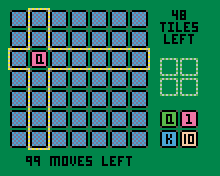 Also is it possible to make so that the game knows when there’s no moves possible and display a game over? As for detecting no further moves, I had though about that, but I really can’t think of a way to do it. Well in this case I guess you would have to run a check that check the tile you are on and see if you can move that many times. And if you don’t have any ‘!’ it result in a game over. So yeah basically what you said I guess would work. 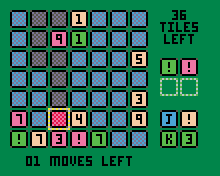 I think it would be simple enough to detect ‘no more moves’ from a numbered tile. 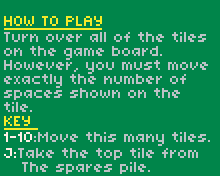 The special tiles should be relatively simple since they only need at least 1 free tile in a row or a column (K & Q), or 1 free tile anywhere (!). Does the player have any more free turns? Can the player move exactly N tiles? but it would essentially just be a variant of flood-fill and/or Dijkstra’s algorithm. but since this is a competition I think it would be unfair to actually contribute code. At least until after the contest is over. By the way, Python does have True and False, like most civilised languages. I’m not sure that detecting being unable to move is 100% necessary, games like Solitaire don’t do it and nobody seems to mind. I am however adding a check to see if you get stuck in a King or Queen move, as well as a game over screen. Part of the reason Solitaire doesn’t do it is because Solitaire was originally played by hand and when it’s played by hand people would have had to discern if there were no moves left by themselves. and those can be really memory hungry if there’s a lot of possible moves. Noggin is a lot less complex because the player is more constrained in their choices. Funny you should mention that, Noggin started out as a card game, when my step brother was trying to come up with a system to ‘cheat’ at pairs. First post updated with a couple of bug fixes and added sound and game win screen. 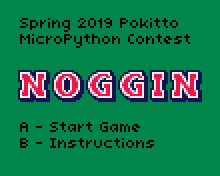 First post updated with manual in pdf format and minor update to game (jack pile is now face down in order to be less confusing). Finally got a chance to play some Noggin! First props for coming up with an original and interesting mechanic for a board/card game, I know it’s especially difficult for this kind of game. Honestly I didn’t beat the game yet, will need to play a few more to get a better grasp on the strategy involved. Just wondering can you (I mean ‘you’ as ‘yourself’) consistently beat the game or is there some luck factor? I liked the simple, yet efficient, aesthetics. Although you didn’t represented cards but just squares (which I understand was better to lay them out in a grid) the green background made me mentally picture cards. Smart color choice. So yeah, a good, solid entry. Oh my this voting will be so difficult. Just wondering can you (I mean ‘you’ as ‘yourself’) consistently beat the game or is there some luck factor? There is luck involved, but also a good amount of skill. Knowing if there’s reasonable risk in wasting a wildcard or deciding which areas of the board to cut off with a Queen being the main decisions. There is a method that will give a slightly better chance of completion - try to fill up all gaps in one area. I usually try to sweep in lines from one side to the other. Spiralling in from the outside works quite well also. re-uploaded .bin and source. It seems I killed the sound at some point without noticing. Fixed that. Popped a youtube video in the first post showing gameplay.